In developing countries, millions of people have no access to even the most basic healthcare services, including safe and effective medicines. Increasingly, developing countries are hit with the double burden of infectious diseases such as HIV/AIDS, tuberculosis, and malaria, and the growing problem of non-communicable diseases (NCDs) such as diabetes and cancer. We have a deep commitment to improving healthcare by developing innovative medicines and widening access to them around the world. Over the past eight years, we have taken steps in a number of areas, including building healthcare infrastructure, sharing data, and developing innovative partnerships, while advancing a pipeline of next generation treatments for NCDs, including immuno-oncology and epigenetic therapies. Intellectual property (IP) stimulates and underpins our continued investment in research and development. Intellectual property protection is a vital part of healthcare innovation, providing necessary incentives for investment in research to create new treatments which can help people around the world. But we recognize that flexibility with our IP, particularly patents, can help us address pressing health challenges, like cancer, in developing countries. What does it mean to be flexible with our IP and patents? In 2016, we evolved our graduated approach to filing and enforcing our patents so that patent protection reflects a country’s economic maturity. For the least developed countries and low income countries, we will not file patents for our medicines, so as to give clarity and confidence to generic companies seeking to manufacture and supply generic versions of GSK medicines in those countries. We recognize that changes to patents and IP systems will not solve the multi-faceted challenges of improving healthcare in developing countries. In cancer, for example, improving outcomes in developing countries requires better funding, improved screening and diagnosis, more cancer doctors and better hospital services as well as access to treatments. But flexibility with our patents can be part of the solution. To that end, in 2016, we outlined our intent to commit our future portfolio of cancer treatments to patent pooling and will explore the concept with the Medicines Patent Pool and our partners to help address the increasing burden of cancer in developing countries. GSK would be the first company to take this step. 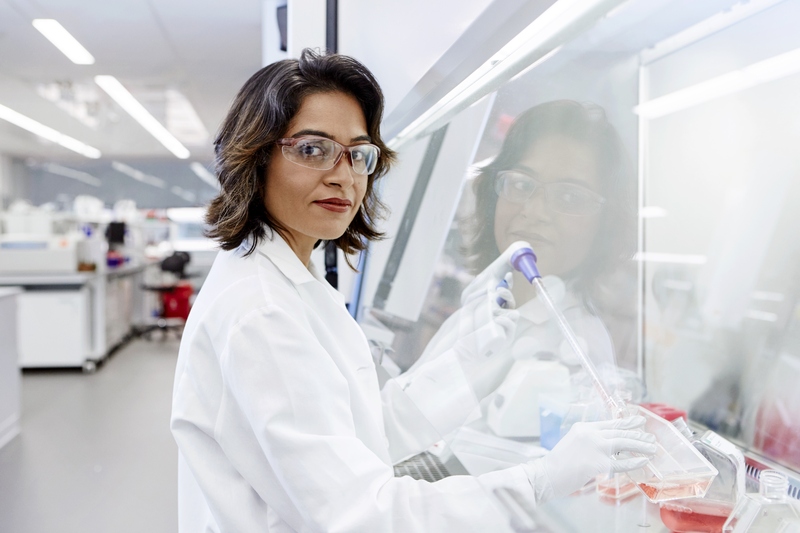 Mili, originally from a developing country, works with a team of GSK scientists at our “SMART Lab” in Upper Providence, PA. She is a translational lead for advancing a targeted therapy for cancer that is currently in clinical development. She knows that, if this compound becomes a successful product, GSK’s flexible approach will help to ensure that her friends in developing countries will have greater access.